RAWR! Don't let the Ann Clark T-Rex get you! This 5 1/4" T-Rex Cookie Cutter works well for kids of all ages, especially for birthday parties and playtime. 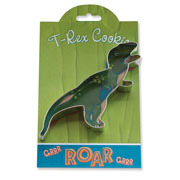 Dinosaur fans love T-Rex cookies and treats as well as T-Rex themed craft projects. Made in the USA.